What’s the difference between a VHF antenna and an FM antenna? Antennas come in all shapes and sizes. If you’re close to the broadcast towers, almost anything will do for an antenna. Even a twisted up piece of aluminum foil or a copper wire will do the job in some cases. Once you get further away though, you need to use the right antenna for the job. The simplest form of antenna is a monopole. The monopole is the basic antenna you’ll find on radios and portable TVs. It pulls out to form a long silver rod, or is encased in rubber to be more durable. A monopole is not a very good antenna but it is very portable. It can be reconfigured, moved, rotated and tilted to get the best reception when it’s in a handheld device. A little above this is a dipole antenna. A dipole uses two rods instead of one. Dipole antennas can also be moved around to try to get better reception. If you’re old enough, you might remember these on the top of televisions. If not, here’s a picture. There was a time everyone had one of these. Why does moving the antenna around work? When you tilt the antenna up and down, you’re actually changing the way it catches radio waves. Every radio frequency responds slightly differently to differently shaped antennas, and by tilting, you’re changing the shape of the antenna. By rotating, you’re also changing the sensitivity of the antenna. All this tilting and rotating is great for an antenna you can reach, but not really great for an antenna mounted on the roof. Roof-mounted antennas need to provide good reception with very little fuss. That fancy antenna on your roof that has all the poles sticking out at different angles is actually a complex array of a lot of antennas, each designed for two purposes. First, each pair of “tines” has to pull in the frequency that you need for one channel, and second, it has to be designed not to interfere with other “tines” in the array. Some are horizontal, some are vertical, some are higher and some are lower. You might remember that FM stations broadcast in the range of 88-107MHz, and that happens to correspond to a space between TV channels 6 and 7. There are some antennas that are designed to get channels 6 and 7 as well as FM broadcasts, but in some cases the antenna that best receives FM frequencies can actually make it harder to pull in channel 6. Remember, each set of tines pulls in a particular set of frequencies. If you have a hard time getting channel 6, you may want to use an antenna that isn’t designed for FM. Remember… just because it says channel 6 on your TV doesn’t mean it’s really on channel 6. Use a resource like antennaweb to find out the actual broadcast frequencies. 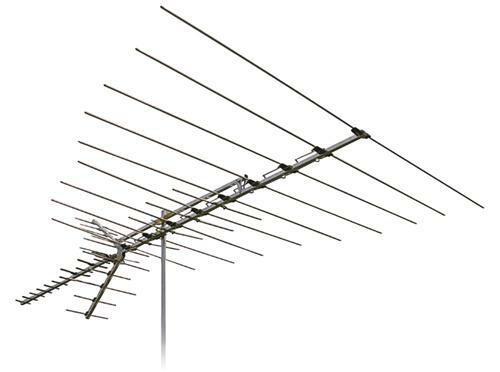 On the other hand, if your market doesn’t use channel 6 at all, a VHF antenna that also pulls in FM is not that more expensive and can add enjoyment to home theater. What’s the difference between a VHF antenna and an FM antenna? Pretty simple. One has extra tines to pull in FM reception, and one doesn’t. In case you’re wondering, that picture at the top is both a VHF antenna and an FM antenna. Can a UHF antenna also pick up VHF signals? FROM THE FRONT LINES: Can you install an indoor antenna indoors? Podcast #295: Is it time to get with the program?